SOFA AND CHAIR: Handmade pieces from plywood, featuring the distinctive lines and shapes of full sized, mid century furniture. Both have foam upholstery, which we have covered in removable, and therefore washable wool felt. But please note that we have used a few straight pins to secure these cushion covers, so this particular room set is unsuitable for very small children. 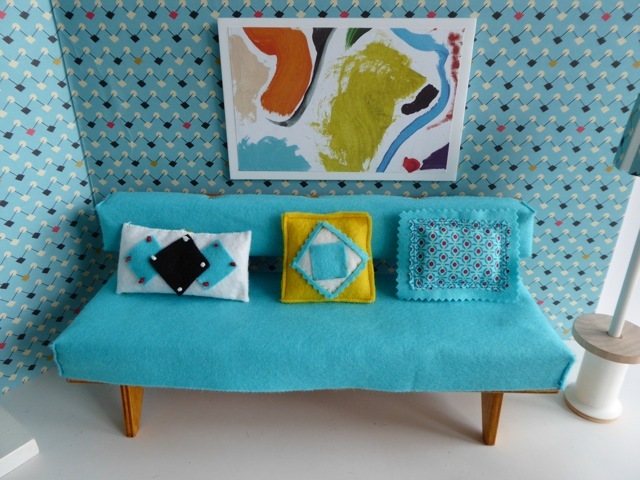 We’ve also added four hand-made cushions, created from vintage fabrics and wool felt scraps – please see the photo of these stylish little cushions up close. Dimensions: sofa length 12in/30.5cm; overall height 5.25in/13cm; seta height 3.25in/8cm; and sofa depth 5in/12.5cm. 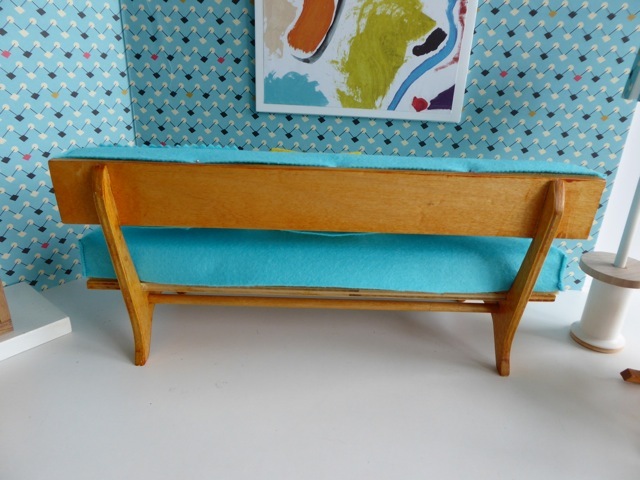 This is a lovely long sofa, perfect for the house with lots of dolls! CHAIR: This is a factory-made item, also dating from the mid century years, featuring the slender spindles which were so fashionable then. TELEVISION: Quite a rare piece, made by the American company, Arco, also during the mid century period. 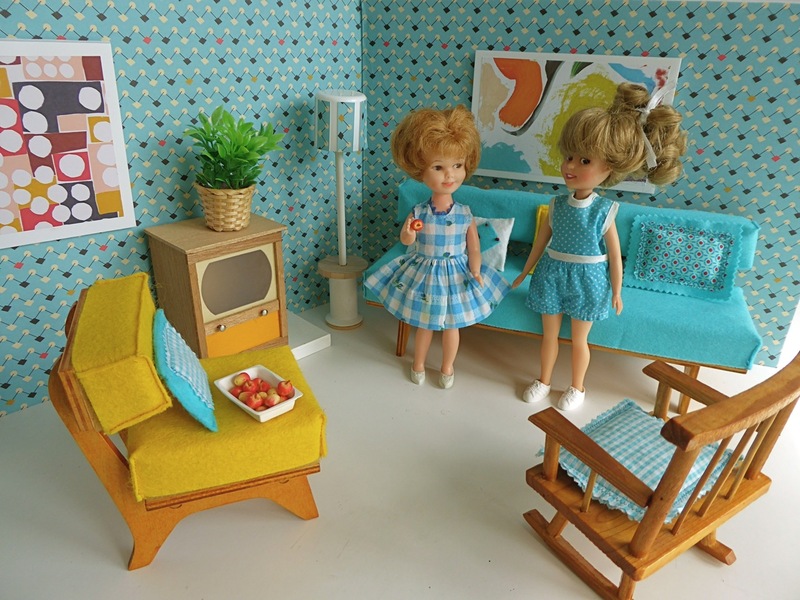 We often come across their fabulous furniture, but rarely find one of the television sets in such great condition! The tv rests upon a wooden plinth, which also holds a (plastic) house plant, while on top of the tv sits a ceramic dish full of tiny apples. LAMP: Handmade from wood and plastic by us. 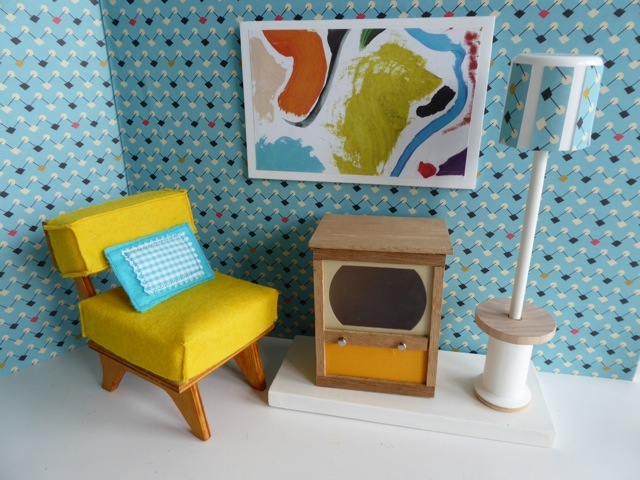 We’ve covered the lampshade in the “atomic” paper to go with this room set. 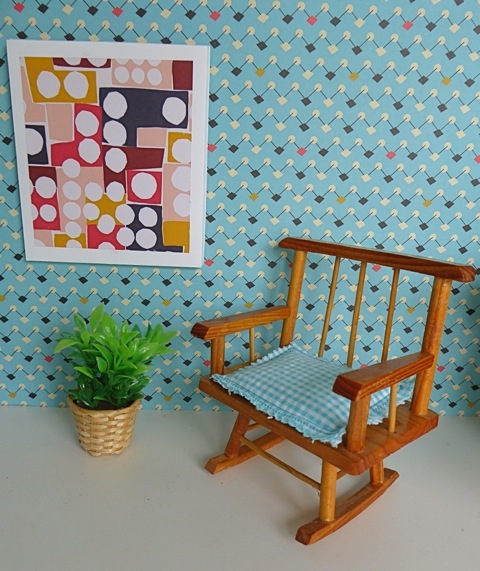 ARTWORK: Salvaged paper scraps have been used to create two moderne pictures. WALLS: Covered in “atomic” patterned, retro wrapping paper - this was the era when the atom was first split and and early satellites were launched into space, hence these characteristic period designs. The paper has been mounted on two A3 pieces of 5mm thick foam board. Each piece of foam board measures 42 x 29.5cm or 11 5/8 x 16 3/8in. Doll: Chosen from our selection of vintage dolls. Shown here on the left, the delightful, dimpled vintage Penny Brite, and her later successor, on the right, also with a similarly mischievous grin. Both dolls are available upon request. Note that there are lots of other clothes available for these dolls on our new Etsy shop, GoodGollyMissDollyUK, www.Etsy.com.